Our lovely blog trip of JD, Anna, Jason and Adam, helmed by our fantastic tour guide, William, was nearing the end of our days when we took a boat from Gisenyi to our final destination (sans flights from Kigali) of Nyungwe. From the Stipp Hotel, we lugged our bags down to the dock and boarded our boat to take a tour of Lake Kivu. On the way to Nyungwe, we stopped at a remote island, Nkombo, in between the mainland of both Rwanda and the Democratic Republic of the Congo. I looked to the banks of the island and saw tiny children on the shore, running like mad. Is this our island stop? Sure enough, the little children were racing our motorboat to the dock at speeds I could never keep up with. We got off the boat and were greeted to throngs of villagers, most dressed in old, tattered clothing, with large smiles on their faces. A group of African dancers immediately began performing for us (we had to pay $50 for the treat, but to get a glimpse of the culture was worth the price). Their moves were graceful, their songs soulful and passionate. These children were a marvel to me. They lived in conditions I could never imagine. They balanced weights on their head than I can balance on my back. They may have been dirty, may have been living in third-world conditions, but it didn’t seem to phase them. It was the life they knew. One little girl stood out in particular — Francine. She was beautiful. Clad in a traditional African print dress, colorful scarf wrapped tightly around her head and her gorgeous brown skin radiating, Anna and I immediately wanted to take her home. Francine silently walked next to us, looking over at Anna and I and smiling. Neither of us spoke Amahavu, a language close to Kinyarwanda, so instead I would put my hand to my heart and smile and say “beautiful,” hoping she could possibly understand the sentiment. I could only imagine the swarm of children that would encircle me if they saw I was handing out little jellies. 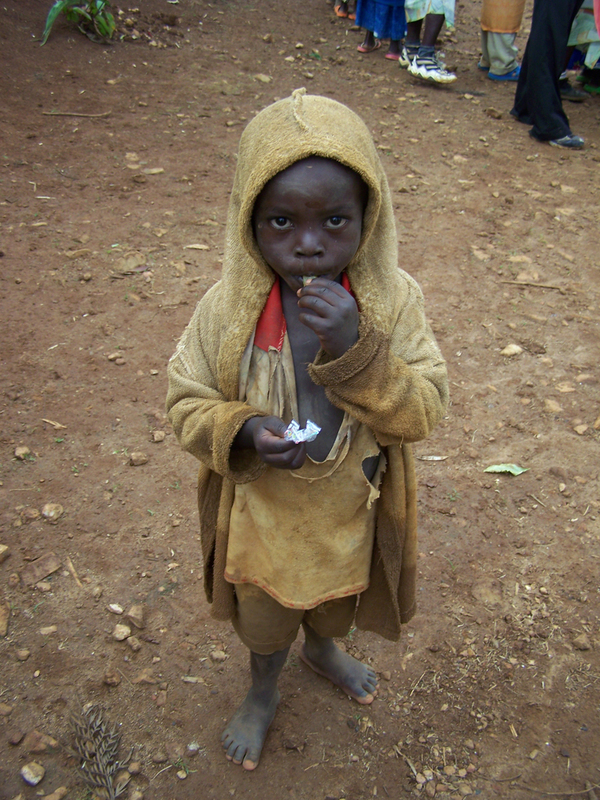 And, then there was the little child with the cleft palate, who came up to me and nearly tucked his head under my arm. He stood like this, facing my body, for a few minutes and my heart melted. Some children would come up to me and demand “Give me your money.” Others would say “Give me your pen.” I had neither. The town followed our every move, when we stopped, they stopped. When we moved, they moved. And nearly all the while, they sang. And danced. And clapped their hands. And just smiled, smiled, smiled. When we returned to the dock, once again, we had the entire village by our side. I unloaded my remaining candies to the outstretched hands of children, my heart breaking when their were more hands than candies to go around. We loaded back onto our boat and waved goodbye. It was time to head to Nungywe National Park , an area with tea plantations climbing up the mountains filled with chimps. Disclosure: Lodging, meals, activities and transport in Rwanda were courtesy of the Rwanda Development Board.